PMEL 17 (also called gp100, ME20-M, or ME20-S) is classified as a melanocyte differentiation antigen. 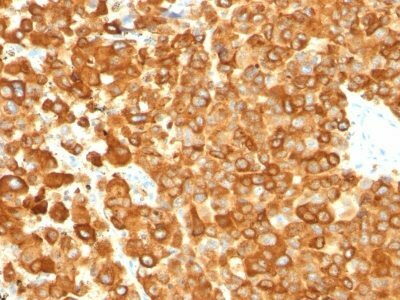 It is expressed at low levels in normal cell lines and tissues, but is upregulated in melanocytes. Cytotoxic T lymphocytes (CTLs) recognize melanoma-associated antigens, which belong to three main groups. These groups include tumor-associated testis-specific antigens, melanocyte differentiation antigens and mutated or aberrantly expressed antigens, which are routinely used as markers to identify melanomas based on their binding to specific monoclonal antibodies. 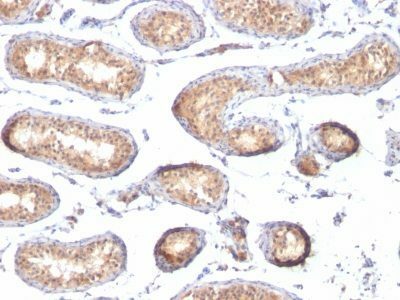 PMEL 17, also designated gp100, ME20-M, or ME20-S, is classified as a melanocyte differentiation antigen. It is expressed at low levels in normal cell lines and tissues, but is upregulated in melanocytes. It is a highly glycosylated, secreted protein that is the product of proteolytic cleavage. Catalog number key for antibody number 0783, Anti-gp100 (PMEL/783) The prefix indicates conjugation, followed by the antibody number and size suffix.